Several times a year an Evangel Home grad will stop by to see her name on the Hall of Faith. The other day, Deborah Harvey, class of 1985-86, was our surprise visitor. 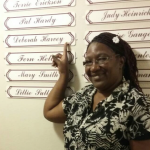 Deborah was in the first group of women to move into the apartment complex we purchased in 1985. Seeing and chatting with her was a wonderful reminder of the importance of the Board’s decision to purchase the complex that we now call CrossRoads. 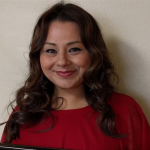 Victoria Rocha, Community Connection, received a scholarship and plaque from Clovis Soroptomists in recognition of her efforts to “enhance her career potential.” Victoria has done extremely well since graduating from the GARDEN in 2014. 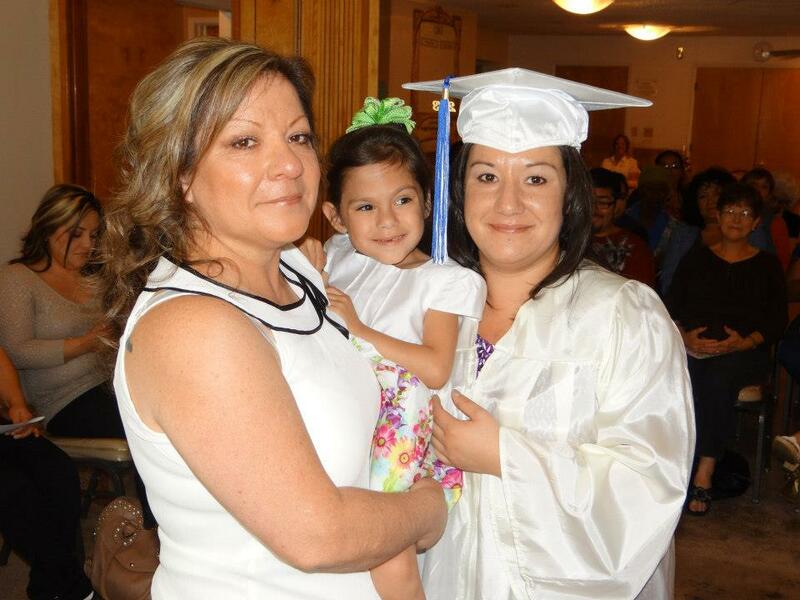 She has lived in our Community Connection program since then, is a founding employee of Five Gals Cleaning, is attending Fresno City College AND is raising five children! For those of us blessed to be part of Evangel Home there is nothing better than a graduation. Brittany, a beautiful young woman of God, graduated from the GARDEN. She is continuing in our Community Connection program. Brittany quoted Leviticus 26:13, a Scripture verse that is particularly meaningful to her: “I am the Lord your God, who brought you out of the land of Egypt so that YOU should not be slaves, and I broke the bars of your yoke and made you walk erect.” It is our prayer that Brittany will never again be burdened and bent down by a heavy yoke of oppression, and that she realizes fully the truth of Matthew 11:28-30. Brittany brings a smile and a servant’s heart to all that she does. She is a joy to be around and we cannot wait to see what the future holds for this focused and humble woman. 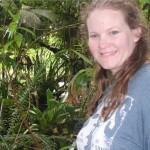 Char Nelson graduated from our GARDEN program in 1999. Her post-grad days were a little rocky for awhile, but once Char was grounded in God, she turned into an amazing Christian woman. It was Char who spent so much tender time with our former staff member, Maxine Miller, when Max was struggling with Alzheimer’s. We first met Anthi in 1990 when she frequented the alley in back of Evangel Home and went through the contents of our dumpster each morning. During that time of her life, she often slept in neighborhood dumpsters. Change is seldom seen more dramatically than in Anthi’s life. She has gone from living in dumpsters to owning a home! Now rather than sleeping on church pews she takes her neighborhood children to church. Here is a glimpse of her story in her own written words. Crystal is supported in her journey by her family and her ADORABLE daughter Khloe, who you may recognize from some of our Day Care posts. Khloe also received her own diploma! Crystal is taking part in our Community Connection Program and will start classes for her LVN degree. Her verse was “Above all else, guard your heart, for everything you do flows from it.” Proverbs 4:23. Crystal and Khloe have brought much warmth and happiness to Evangel Home and we know that the Lord has Crystal in the palm of His hand! I lived all of my young adult life, and a large part of my adult life, as an addict without direction or any sense of belonging. Prostitution was how I made a living (what I called a living at the time).That lifestyle landed me in jail, and I was “sentenced” to Evangel Home’s GARDEN program. It ended up being the greatest thing that could have happened in my life. I came to the GARDEN in 2000. I came with all my secrets and garbage. I received an education from the Home that is priceless. I was taught how to deal honestly with my issues as a whole and how to live life on better terms−dealing with both the good and bad. I received a solid foundation to stand upon and the tools to build on that foundation. I was firmly planted and rooted in love, something that I really knew very little about. I graduated from the GARDEN and had just moved into the Community Connection (graduate) program when my foundation would be shaken. My son, Capers, was murdered in a random shooting in July 2001. I could literally feel my heart melt inside of me and fade away. At his bedside, on my knees, I begged God to give him another chance because I could not bear this pain. I soon realized that my son was given something greater than another chance in this life that day. He was at my graduation just a few weeks earlier and had even brought flowers with my younger son, Benjamin. He had been given the opportunity to see his mom living the right way before he died. My life has most certainly been a constant change since the death of my son. I cannot tell you where I mighty be if I hadn’t been at Evangel Home when this tragedy happened. Today I am a proud member of the Evangel Home staff (part-time) working side by side with those women who fed, encouraged and loved me where I was. I’ve been given an opportunity to give something back. Today I belong to the Evangel Home and I have a good sense of direction. I am currently employed at Evangel Home. 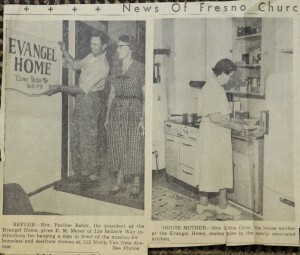 Evangel Home became part of the Fresno community in 1955. The ripples sent from this ministry have not only changed thousands of lives, but also affected generations. One such life is Elizabeth.The scene is Christmas 1976. A mother and five children stand on the front porch. The only little girl in the group, 7-year old Elizabeth, peers into the windows. Inside the big house, a Christmas party is coming to an end. A staff member is handing out toys and hugging the children. Elizabeth’s family is not in time for the party, but the staff member spots them and later gives the little girl a doll, which becomes her treasured friend. Twenty years go by and the little girl is now married with two little girls of her own. She is taking a class at California State University, Fresno and needs some volunteer hours to fulfill the requirements. She remembers the place where she spent Christmas so long ago and calls to ask if she can complete her class assignment there. A class assignment for this now-adult woman brought up a memory of the gift of a doll (which she named Crystal and still has) and a place that made her feel loved and secure as a child. What was to have been a 10-hour assignment led to 160 hours of volunteer service, then to a part-time position. Now she is a full-time house manager. The little girl who once stood at the door and knocked, now stands on the inside to open that same door and welcome others to the safety and warmth she experienced in her time of trouble. “What’s going to become of me?” No child should ever have to worry about that. Elizabeth found love and stability at Evangel Home and now she helps provide that to others. She still remembers learning Jesus Loves Me…a song she didn’t know until our staff taught it to her. Years later, she taught it to her own daughters. Going through our box of treasures the other day, and we found this newspaper clipping in an envelope. This is early 1955. We opened in February of that year in a house that is literally a stone’s throw from our current facilities. Wonder what these three wonderful people would say if they could visit us today? Do you realize how committed and unconventional they had to be in order to have had the courage to found Evangel Home? Thank God for their devotion. In 1990 Anthi Renteria was our neighborhood bag lady. She ate and slept in dumpsters, was strung out on drugs, and survived by relying on the kindness of neighbors – and strangers. Eventually Anthi got cleaned up enough to come to the front door of Evangel Home and seek help. Although she never entered one of our long term programs, she entered our hearts and we began a special relationship that lasted until the day she died in July of 2016. Anthi is one of many. 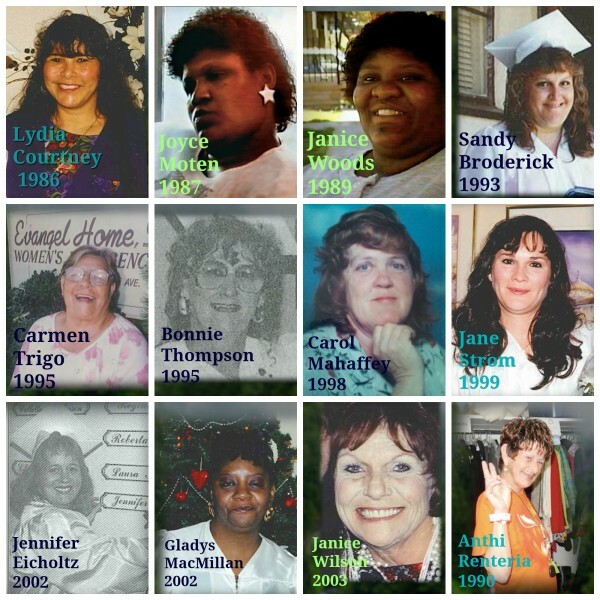 She and the rest of the women on this page all graduated from Evangel Home. Their graduation date is listed with their name. We know that other graduates have most likely passed away, but we have not been told. So if you know of a woman who graduated from CrossRoads (formerly called the Extension Program) or the GARDEN, please let us know. We would like to pay tribute to them also. (c) 2018 Evangel Home | Website designed by our friends at Helps2.